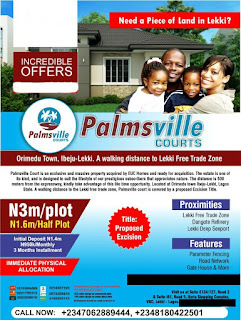 Palmsville Court is an exclusive and massive property ready for acquisition. The estate is one of its kind, and is designed to suit the lifestyle of our prestigious subscribers that appreciates nature. Looking at the nature and calm environment of, investing in it is something you will ever be happy with. The distance is 500 meters from the expressway, kindly take advantage of this life time opportunity. Located at Orimedu town Ibeju-Lekki, Lagos State. A walking distance to the Lekki free trade zone, Palmsville court is covered by a proposed Excision Title. 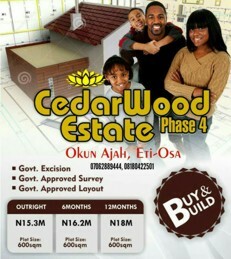 A plot of land is currently selling for 3 million Naira and half plot at 1.6 million Naira and the allocation is immediately after buying.